Purchase from DWQuailGolf and get a FREE Bonus Gift, FREE Shipping AND an EXCLUSIVE Instructional DVD! Momentus Speed Whoosh Increase your club head speed. Perfect your timing with the Momentus Speed Whoosh . When you swing the Speed Whoosh several times in a row at speeds of 20+ mph faster than your own driver, this action activates your fast twitch muscle fibers and readies them for action. Then, when you pick up your own driver and hit a tee shot, you can expect to add 7 to 10 mph in club head speed instantly, translating into a tee shot flying 21 to 30 yards farther. Set the Magnetic Timing Ball at the end of the shaft and swing the Speed Whoosh six times in a row as fast as you can. You'll hear the sound of increasing club head speed by the "WHOOSH" it makes when you swing it. This will immediately activate the fast twitch muscle fibers used to swing your golf club. Switch to your own driver, and you'll increase your club head speed 7 to 10 mph instantly! Repeat this action regularly to further add to your swing speed and maximize your distance off the tee! Place the Magnetic Timing Ball at the grip end of the Speed Whoosh. The magnetic feature built into the ball and grip will keep the ball in place in your back swing. Swing the Speed Whoosh so that the Magnetic Timing Ball releases. 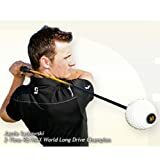 Momentus Speed Whoosh Golf Swing Trainer is a great tool to add to your golf training aids arsenal! Includes an Exclusive Free Bonus DVD From the Golf Lessons With O'Leary Series With Your Order (a $49.95 value) - Limit One Per Order. The Speed Whoosh works 2 ways: 1) It increases club head speed, resulting in more distance & 2) The proprietary Magnetic Timing Ball improves timing. The Speed Whoosh is a revolutionary club head speed accelerator that activates the fast twitch muscle fibers to swing the club 7-10 mph faster after only 6 swings! This is an increase of 21-30 yards in carry distance! The Magnetic Timing Ball slides down the shaft to perfect your timing and eliminates the tendency most golfers have to cast the club from the top. The Speed Whoosh will increase your club head speed instantly and give you the sense of the perfect release every time.